Where will you dry your clothes in the winter? During the spring and summer, our homes enjoy the light breeze from opened windows and balconies, giving us the opportunity to breathe in fresh air and enjoy warm long days. During these months, we all like to hang up clothes in our rooms, since they dry quickly and leave a fresh smell in our home. However, during the cold winter days that are quickly approaching, drying our clothes properly is much trickier than you might have thought. Drying your clothes inside during the winter and trying to speed up the process by placing them near a radiator drastically increases the humidity level in your home. Warm and humid environment is ideal for breeding of mould spores that can cause serious lung or sinus infections. Moreover, drying clothes indoors can increase the level of volatile organic compounds from chemicals used for washing in our homes. These compounds can be carcinogenic and can trigger asthma, and irritate eyes and skin. A common solution for these issues is the use of a tumble dryer. If possible, use a good tumble dryer. This will not only help you get through the winter healthier, but also leave you with less ironing and therefore more free time. If you decided to line dry your clothes indoors, make sure you regularly and properly ventilate your home. If possible, choose a room where you spend the least time for drying. It is also strongly advised to switch to a natural and organic washing detergent that will prevent vaporization of dangerous chemicals into the air that your breathe. If there is a sunny but cold day outside, do not be afraid to move the drying rack outdoors; however, the drying process might be a bit slower. 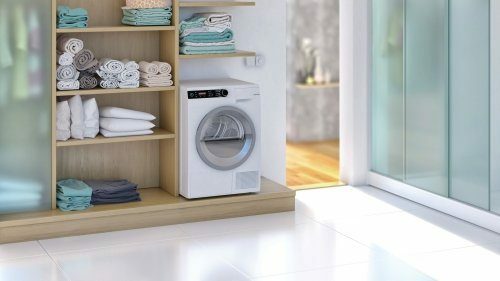 Its drum delivers the power of negative ions that make the laundry extra soft, pleasantly smelling, and free of allergens. It also dries the laundry in a way that makes ironing very easy and often not required at all. With GentleCare mode for delicate drying, you can now dry almost all your garments.